While this recipe doesn’t taste like actual candy corns (thankfully in my opinion! LOL) it does look strikingly beautiful as a fall or Halloween dessert! Honestly the three distinct flavors in this cheesecake play wonderfully together. 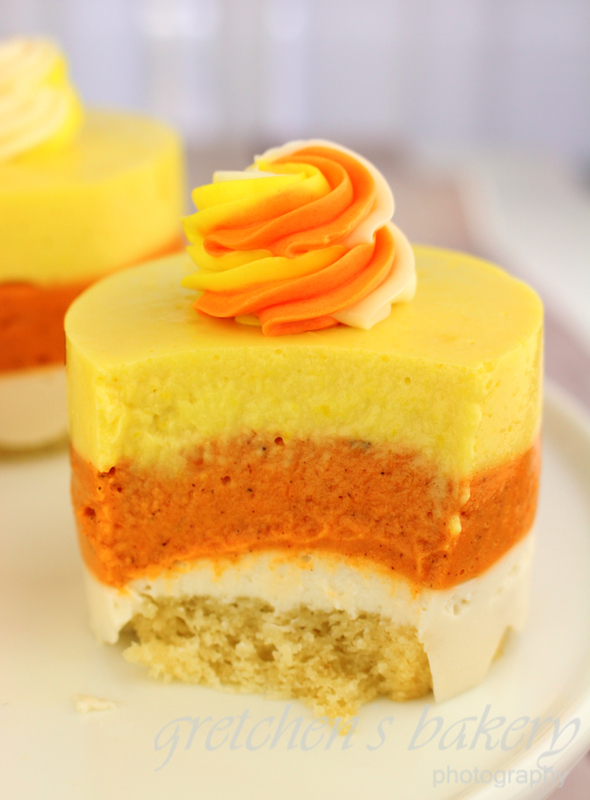 One layer of vanilla, one layer of pumpkin and one layer of corn. Yes I said corn cheesecake. It’s not so unusual when you think about it, after all corn is one sweet vegetable! Nature’s candy! 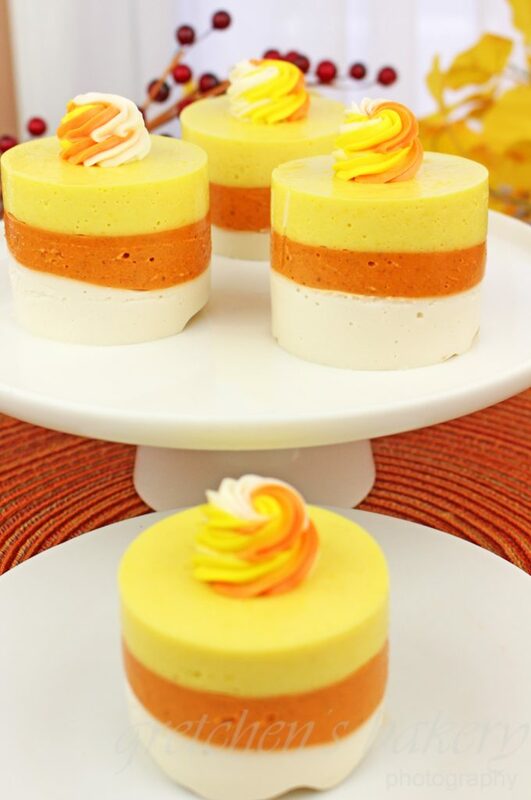 It makes a perfect base for the yellow layer in this “candy corn” inspired cheesecake and against the vanilla and pumpkin it really just works! This recipe is quite simple to make, however I am making it three separate times because in order to get the distinct layers of each color, each layer must chill and set before adding the next layer. So a dessert like this one is going to take time, but the final effect is well worth it! We are getting into advanced pastry preparations with this one guys! I know I listed this recipe under “no bake desserts” but I then decided to use a base of my most recent white chocolate cake recipe but in all actuality you really don’t need a cake base at all. You can certainly make it simple and just serve it as a pure mousse dessert. Alternatively you can make this entire recipes into a larger family style or event cake and use an 8″ Stainless steel ring mold too or get super simple and serve this cheesecake in individual glasses! Since I made my desserts in 3" individual molds I've baked my white chocolate cake into tiny cupcakes as this one the perfect size to fit into the bottoms. Combine the flour, baking powder, EnerG egg replacer, and salt in a mixer bowl and sift it together or mix on low to combine. Prepare the fist layer of cheesecake by combining the soy milk, agar and sugar in a medium heavy bottom saucepot. Remove from heat and combine the vegan cream cheese,lactic acid or apple cider vinegar, and vanilla extract in a food processor or blender. Prepare the pumpkin cheesecake the same way by combining the soy milk, agar and sugar in a medium heavy bottom saucepot. Next prepare the corn layer by combining the soy milk, agar and sugar in a medium heavy bottom saucepot. Cheesecake must be kept refrigerated and can be stored for up 1 week in the refrigerator covered well.